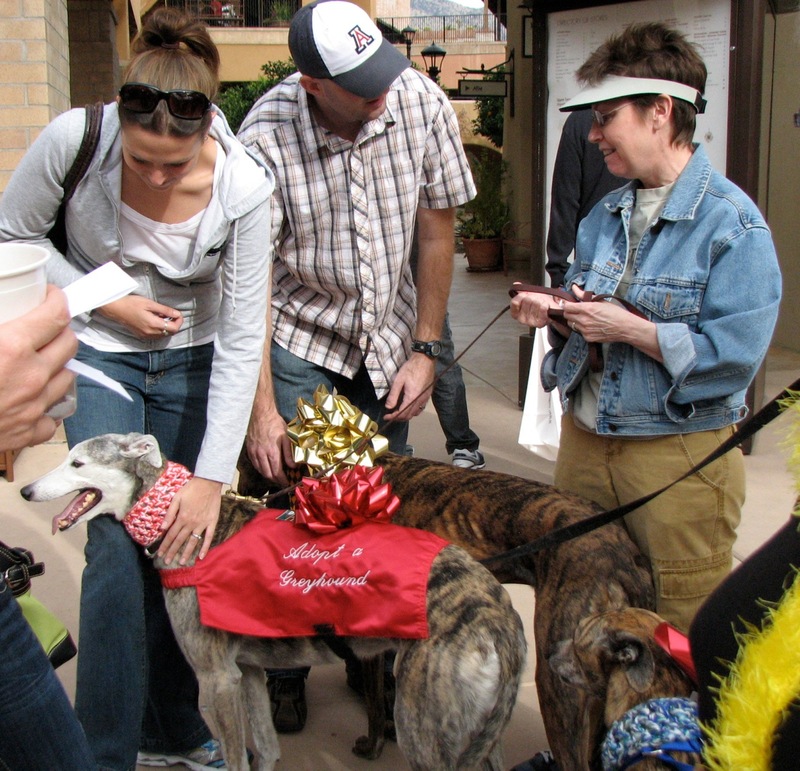 On the afternoon of December 20, 2009, at 1:30 p.m., five Arizona Greyhound Rescue adopters met at La Encantada and took their hounds for a stroll: Marlene Fischer with Alyse, Mary Freeman and Diana Hansen with service pooch Buddy, Cynthia David accompanied by Harmony, and Mr. Beams took his caretaker Glenda Taylor. Large Christmas bows were attached to the dogs’ collars and, while most stayed put, one consistently wobbled off to the side: Mr. Beams. The shoppers and their children were very receptive and delighted to pet the greyhounds and the dogs lapped up the affection. The AGR volunteers had an opportunity to share with the holiday shoppers the news that the Phoenix race track was closing, and the need for adoptions, fosters, or donations to rescue groups in Tucson that will be taking in some of the Phoenix dogs. Cynthia created a brief handout that included the websites for AGR and Greyhound Adoption League for people to donate to help with the cost of caring for the displaced Phoenix dogs. We’d planned on staying for an hour, but we were still ‘at it’ come 3:30 pm. We met some fabulous dog lovers and passed out a load of handouts.